Blog New Art Gallery opens last Saturday on Spring St! New Art Gallery opens last Saturday on Spring St! Owner Mike Elder stands in front of his new space at 103 Spring St. 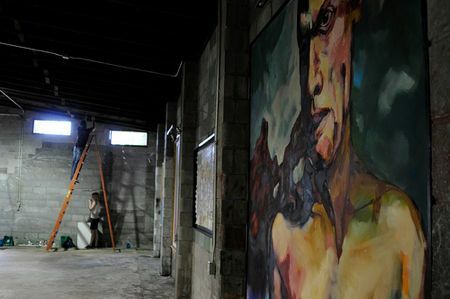 It was over a year ago that Mike Elder and his partner Adrienne Antonston first had the vision that this dirty nasty auto body repair shop could become Charleston’s biggest and best contemporary art space. The space at 103 Spring has so much to thrill and surprise a viewer, and then they add the art…The two biggest shockers are the fact that the building is home to a facade of an early 1800’s house. The facade complete with windows, doors, hardware and even what is left of it’s original coat of paint stands to the left of the room behind an i beam and iron pillars. The back doors of the building open to surprise even more. From the cool concrete space, you emerge into a lush garden with cool blue ponds complete with floating lily pads and orange fish. Overall the experience is something like going through Tolkien’s wardrobe or Carol’s rabbit hole. Eye Level Art @ 103 Spring St. is not to be missed. 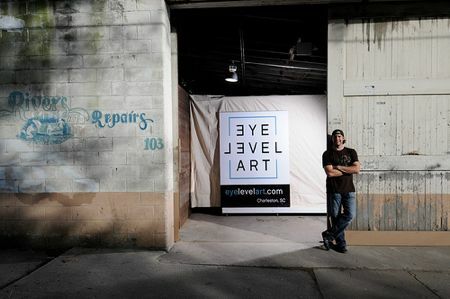 To keep up with their schedule of events check out EYELEVELART.COM or just stop by, the space is open continuously through Spoleto from 5-8pm. There is always plenty of parking (take Spring St from King cross Coming and the space is on the left before Rutledge Ave. 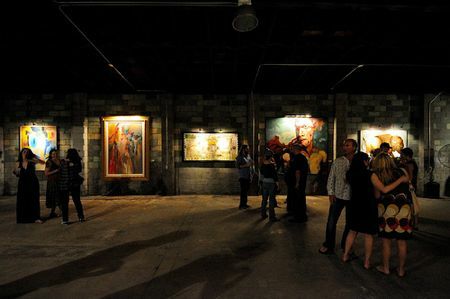 Finally a Charleston Gallery large enough for BIG paintings!